With the big game less than a week away and Oregon fans descending on Los Angeles to indulge the final Oregon football game of the season, we at FishDuck thought it was as good of a time as any to let you know about all the great events happening around the Rose Bowl. See, for anyone who has gone to a BCS bowl game before be it the Natty or Fiesta Bowl or previous Rose Bowls know, the game itself is just one part of the overall festivities. There are team events, press conferences, pep rallies, fan events, concerts, and other general occasions to party and celebrate in reverie over the love we all share for our Oregon Ducks. Some members of the FishDuck team will be in Los Angeles for the game, participating in many of these events, so we felt it appropriate to provide all of you with some information about all the great events taking place in addition to the football game January 2nd. First, if you need a refresher on Oregon’s history in the Rose Bowl and all the great events taking place, I put together this video. See below for more details on events to attend. Spending new years eve in Los Angeles? 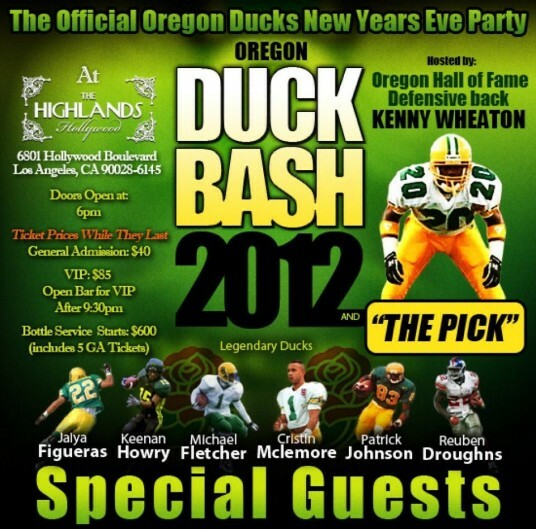 Then you can’t miss the big Oregon Ducks New Years Eve Bash, hosted by a slew of Oregon Ducks legends. It takes place at The Highlands in the heart of Hollywood, CA, about a 15-20 minute drive from Pasadena. General admission includes party favors and a midnight champagne toast, VIP passes include party favors, champagne toast, and open bar after 9:30pm. The Kickoff Luncheon presented by US Bank is a dynamic mid-day pep rally featuring celebrity sportscasters as they present the university coaches, athletes, marching bands and pep squads of the teams participating in the 98th Rose Bowl Game. Honored guests include the Rose Queen with her princesses and the 2011 Rose Bowl Game Hall of Fame inductees. Tickets and more information is available here. Once fully recovered from the new years eve hangover and big meal, head down to the Santa Monica Pier for the Oregon Ducks Pep Rally on Sunday, January 1st, at 3pm. The event will include the Duck Store, the Oregon Marching Band, Oregon cheerleaders, guest speakers, and surprise guests. The event is free, more information is available here. After the pep rally ends at 5pm, walk over to Yankee Doodle’s on the 3rd Street Promenade for food & drinks with fellow Duck fans. Yankee Doodle’s is the official hangout for Oregon fans all week long, located a short walk from the Santa Monica Pier. Click here for more information. 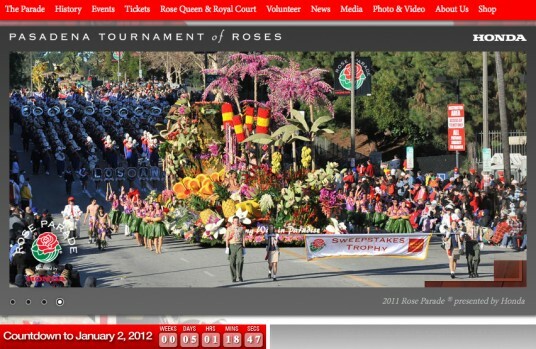 The Tournament of Roses Parade has been a tradition since 1890. Featuring exquisite floats and surprises along the parade route along Colorado Blvd. in Pasadena, the Tournament of Roses begins with the morning parade and ends with the traditional football game held at the Rose Bowl. Click here for more information. Start your game day with Duck fans at the official Oregon Tailgate at Brookside Golf Course right next to the stadium. Entry fee includes complete buffet lunch, open beer and wine bar, and entertainment. This event sells out so buy your ticket today! Click here for more information. The big game, the reason we’re all here in Los Angeles. Kickoff is slated for 2:10pm, be sure to give yourself ample time to pass through securty and reach your seat as the Rose Bowl tunnels can sometimes turn into bottlenecks. Click here for more information about the stadium and game. Think that when the clock hits zeroes inside the Rose Bowl that the good times are officially over? 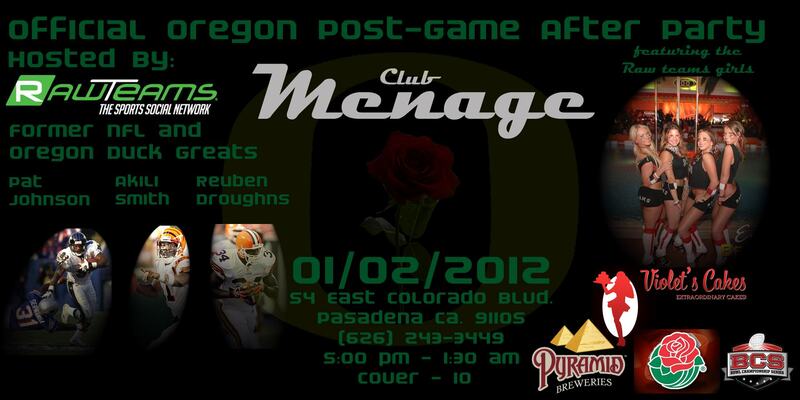 Think again, as several Oregon Ducks legends are hosting a grand post-game after party at Club Menage in Pasadena just a short distance from the Rose Bowl stadium. So after the game and the Ducks are finished hoisting their Rose Bowl trophy in triumph, come party with Akili Smith, Patrick Johnson, Reuben Droughns and other Oregon fans and former players at Club Menage, presented by www.rawteams.com. For a full press release and more details on this event, please click here. We’ll hopefully see you at these great events, and GO DUCKS!! !